Are you a recent grad or thinking of switching your career? If so, you probably don’t have as much experience as someone who has been in the workforce for the better part of a decade. An entry-level resume should focus on transferable skills and education more than work experience. 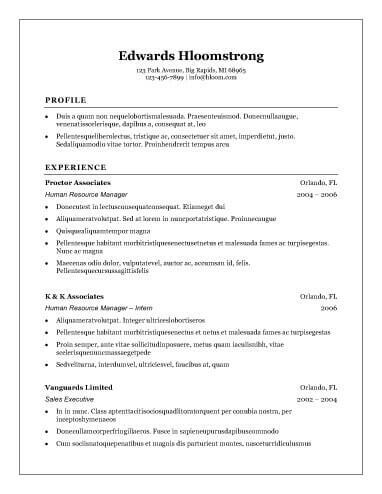 Thankfully, we offer lots of beginner-friendly free resume templates. Are you looking for a document that has universal appeal? Hiring managers love basic formats because they are easy to read and focus on your skills and experiences. This simple layout can still include a few embellishments, such as vertical lines, borders, or lists, to ensure each section stands out. Free resume templates in this category work well for professionals in conservative lines of work, including lawyers, accountants, and engineers. Work History: Even if you have little work experience, you need to include this section. Always try to list position titles, company names, employment dates, and three to five accomplishments for each job.